Trellis’s……….what a way to add vertical color to your patio, porch, side yard, or hide/soften the unsightly concrete/stucco foundation you’ve been wondering how to disguise! And how about the side of that garage? “blech”! Trellis’s are every shape, color, and building medium you can imagine…..and even more than you can’t imagine! We have a copper coated trellis that looks like cattails and reeds stuck in a planter box that hides the ugly concrete foundation. The trellis is so cute that I don’t plant anything around it that will actually climb on it J. 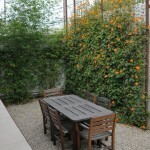 We also have a short bamboo trellis with the most delicious honeysuckle climbing on it next to our patio. The bamboo looks great with the new cushions I made out of a tropical-ish fabric. Add a couple potted palms, and who needs a vacation?? Just kidding- I do! Trellis’s can actually become living walls for privacy and can be stand alone to create a border to define spaces within your yard. I absolutely LOVE this idea. 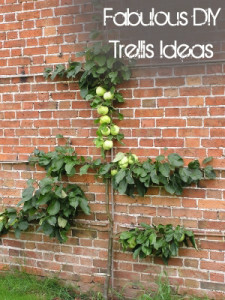 The trellis can be as long or as narrow as you wish. 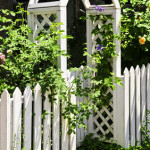 Consider extending a corner of your house with a trellis to add privacy to a courtyard area. In fact, you could define an entire “room” with these wonderful living walls. Think outside the box: A trellis can come inside, too. Hmmmmmm………….new possibilities. Hi Sue! Stopping by to check out your awesome blog, wow, those clocks! Wanted to fyi you on the trellis picture on the brick wall.